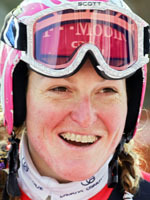 Janica Kostelic became a true legend with a record three Alpine titles at the Salt Lake 2002 Winter Games, a triple only preceeded by the greats Tony Sailer and Jean-Claude Killy. The good humoured Croatian notched up a magical hat-trick of titles in the Utah resort with wins in the giant slalom, slalom and combined races to go with a silver in the super-G.
She would go on to write her own page of history four years later when the Games moved to Turin earning a fourth gold on the Italian slopes by racing to the combined title. She followed the achievement of Norwegian Kjetil-Andre Aamodt had become the first skier to win four Olympic titles just 20 minutes earlier on a frosty day on February 18, 2006. Another impressive and rare achievement was that she finished her career at only 25 as a result of nagging injuries with at least one victory in all five of the World Cup disciplines. Only Petra Kronberger of Austria and Sweden's Pernilla Wiberg on the women's side have pulled off this display of all-round skiing. Had her career not been cut short with numerous knee operations and a declining physical condition including thyroid surgery insurmountable, the pint-sized Croatian would certainly have racked up more records. "Injuries, I have had plenty and I lived with them for a long time but I was able to forget them during competition and training," she once said. After Turin, Janica handed the family's skiing responsibilities to her older brother Ivica who continues to compete on the World Cup circuit and is an Olympic medallist. She first made her debut on the circuit in 1997 as a confident, swaggering competitor who appeared certain of her destiny before she was hit with her first spate of injury problems. A serious knee injury in 1999 almost finished her off before she really got started but driven on by her father Ante, who is a former professional handball player, she clawed her way to the very peaks of skiing. Eleven months later, she had beefed up and added 17kg of weight and even more hungry for success. Nine years later she had left a trail of success with 6 Olympic medals (4 gold, 2 silver), 5 world titles including an historic hat-trick in 2005 and 3 World Cup overall crowns. These all sit nicely alongside the crystal globes picked up on three occasions in the slalom and a quadruple of combined crowns for a staggering total of 30 wins on the circuit. A superstar at home in Croatia, she can rest her aching body now after retiring in 2006 and look back on one of the most successful careers in the history of skiing.